Matt Kenseth completed his comeback from the 18th. 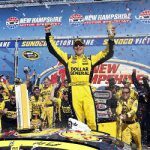 position after giving everything and make his way toward the end of the race for the victory of the New Hampshire 301 this Sunday at New Hampshire Motor Speedway. In what was his 2nd. win of the season and 3rd victory of his career at the Magic Mile, Kenseth crossed the finish line with an advantage of under 2 seconds (1,982) over Tony Stewart, who solidified his position in the Top 30 of the drivers, with his 2nd. place. “Jason Ratcliff, (Team Leader) and the rest of the team made great adjustments today. I did not do a good job in qualifying (18th. ), But today after the first round of pit stops, we had to get there. It was a fun day, “he added. Kenseth, who recovered from a mistake in the pits after his Joe Gibbs Racing Toyota No. 20 was left sitting in his stall, on Lap 271 he finally took the lead from a speeding Kyle Busch and, despite the following three yellow flags and the pesky restarts, did not move from there until the end of the race. “And then, after a few laps, we were able to do well in the middle and escape,” Kenseth added. Joey Logano came in 3rd. place with a lead of 0.09 seconds over Kevin Harvick. Greg Biffle finished 5th., Followed by Jamie McMurray, Ryan Newman, Kyle Busch, Denny Hamlin and Ricky Stenhouse Jr. to complete the Top 10. Among the top drivers for the race Martin Truex Jr., was not in the list, he led the race for 123 laps, but was clearly affected after breaking the shifter and clutch damage to his No. 78 Toyota. Jimmie Johnson, who started from the pole position, but steadily lost ground on restarts to eventually finish in 12th. position. Outside the Top 10 also was Kurt Busch, who ran among the top five most of the race but was left out after being hit by the No. 88 Chevrolet of Alex Bowman, who closed the day at the 26th. as a substitute for Dale Earnhardt Jr.
Roger Goodell Is at it Again!